Defoor Brothers representatives pose with members of the Chattanooga Chamber of Commerce to celebrate the grand opening of Peet's Coffee. Peet's offers coffee and tea for purchase by the bag in addition to tea and specialty and drip coffees. Peet's Coffee is now open at its Chestnut Street location, the first location anywhere in the South. As the 800 block of Chestnut Street and the surrounding area undergo a planned $84 million upgrade, new shopfronts have already begun to appear. While some — like Peet's Coffee and Shula's Steak House — have names Chattanoogans may not yet recognize, to others across the country, those names are already noteworthy. Officials with DeFoor Brothers Development, the group in charge of the extensive upgrades across the 800 block, say that soon, hopefully that name recognition will extend to the local level as well. "It took some convincing to get," DeFoor Brothers Development representative Jay Raynor said of the California-based coffee shop now open at 819 Chestnut St. "We're the closest one, basically, between here and D.C. or here and Chicago. Peet's doesn't look to expand except for in the larger cities: Philadelphia, Chicago and New York. We were fortunate that we were just able to give them the big-picture plans for the area and have them buy into it." The development group's work on the new Chestnut-area plan includes a 254-room Westin Hotel with a Shula's Steak House, Pinkberry yogurt shop, Millennium Bank and more, slated to open this winter or early spring. Shula's is like Peet's in that — so far — it is only known in larger markets like Chicago, Houston and Birmingham. The Peet's Coffee brand was first incorporated into the Embassy Suites off of Gunbarrel Road, due to DeFoor Development co-founder Byron DeFoor's love of the brand from his travels up north and out west. "Chattanooga more and more is getting business people who are traveling from out west, specifically," Raynor said. "And they love the thought of being able to have a little taste of home while they're out in this part of the world." Outside of California, the Berkeley-based Peet's brand has locations across Illinois, Massachusetts, Oregon, Virginia and more. "I think in a lot of ways, the philosophy of the Peet's brand even at a corporate level is a lot more like a local coffee shop in the way that they do their roasting process. It looks more like a small shop than a big chain," said DeFoor Development representative Blake DeFoor. " It is a larger brand, but it's one that has really been focused on how they grow and making certain not to sacrifice quality." 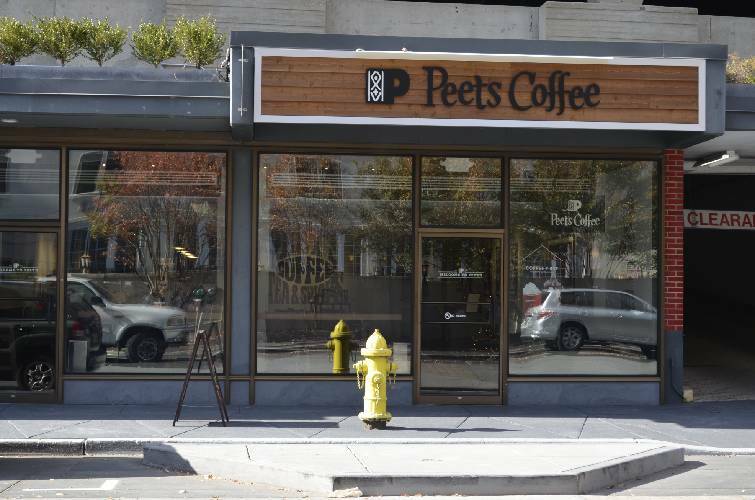 "Chattanooga tends to prefer local or unique options, so we thought that Peet's was a unique hybrid of a name that was notable but not one that was close to here," Raynor added. The Chestnut Street Peet's location offers tea, drip coffee and specialty drinks, as well as whole-bean and ground coffee for purchase. For more information, call 803-9719 or visit peets.com.